A food processor will surely come in handy if you are considering of making this dish. You can choose any fish that you like for this recipe. I normally use cod or snapper, but haddock or turbot should also work. Make sure you don’t puree the fish. Just a quick mix or chop would be good enough. I like to add water chestnuts as they can give the cakes a crunchy taste. 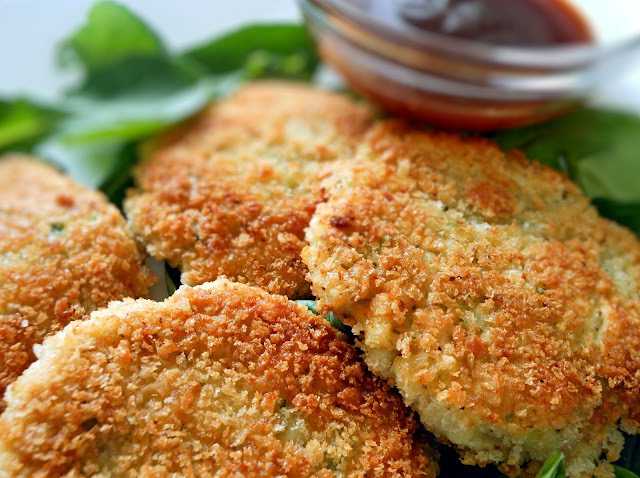 Some fish may have a fishy taste, with the sweet and sour sauce on top when served will turn the fish cakes into a delicious dish. Combine fish with flour, chicken broth, egg, 1 tablespoon oil, salt and pepper in processor. Mix for 15 to 20 seconds at medium speed. Add remaining ingredients of green onion, onion, garlic and water chestnuts and give a little pulse. Fish paste will be created. Form the paste into patties. to 2 to 3 inches in diameter and half an inch thick. Drop them into bread crumbs to form a coating. Should make about 6 patties. Heat 2/3 cup of oil in a frying pan over medium heat. Place the patties in hot oil and fry them until golden brown. You might have to reduce the heat to medium low if the bread crumbs turn brown too quickly, or to use a spatula to press down the patties while frying. This way, the inside of the patties can be cooked faster. Remove from heat and serve with sweet and sour sauce. Combine corn starch with water. Stir until dissolved. Place the vinegar, brown sugar and ketchup in a saucepan and bring to a boil. Add corn starch mixture and stir quickly until sauce is thickened.